The Clasicos Light Onyx Cremation Urn is made of pure onyx and is finished to a beautiful shine. The urn features a classic design with a dome lid. A beautifully made urn that will bring peace to your heart. 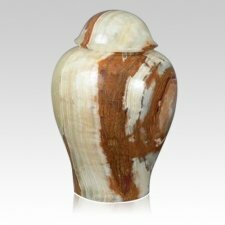 Colors may vary in natural onyx urns.